Linguine with Scampi » Take, Make, Drain, Linguine, Salt, When » tobias cooks! My trip to the central fish market at Athina’s Street was successful and I returned with a nice and fresh piece of tuna fish and some great looking scampi. 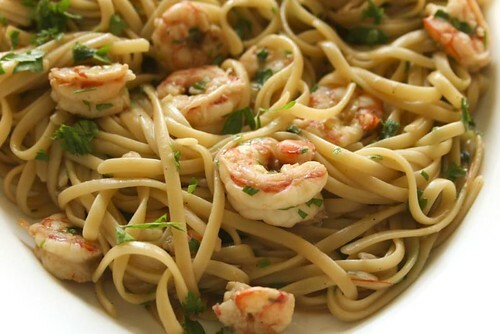 I like scampi on the grill but I as well love them in combination with pasta, preferably linguine. When combining scampi with pasta, the essential thing is to have some fish-fond available. I create the fond from the scampi themselves, or rather the shell of the scampi. When you buy scampi make sure to get fresh ones that still have the shell, or the dish will not taste the same. Shell the scampi but keep the shells. Put the shells into a soup pot and heat them with some olive oil. Fry them gently for a few minutes, then add some vegetables. Take a carrot, half a leek, half an onion, some celery and ad 2 bay leaves and some pepper corns to the pot. Bring to boil and let it simmer for 20 minutes. Heat olive oil in a frying pan. Add the chopped onion and let it get some colour. Add the sliced garlic and the scampi. Fry them for 5 minutes until they turn red. The frying time may differ with the size of the scampi. Make sure you do not overcook them, you want them rather raw than too much fried. Take the scampi out of the pan and leave them on a plate. Drain the fish fond and pour 2-3 cups of the font into the pan. Reduce the liquid on medium heat. Meanwhile bring water to boil and cook the linguini. Cook them only half way through. They should bend in the pot but not be al dente yet. Drain the pasta and put it into the frying pan. Make sure the pasta is covered in the reduced fond. In case it is not covered, ad some of the fond to it. Let the pasta cook in the liquid until the liquid is soaked up and evaporated. Tossing and turning the linguine occasionally helps the evaporation of the liquid. You want the sauce to thicken nicely. Once thickened and reduced to the point where the sauce only covers the ground of the pan add the scampi. Take the pan of the heat. Toss well. Season with salt and fresh pepper. Serve garnished with a bit of chopped parsley. Keep the fish fond in the freezer. You will need it soon! the german version “Linguine mit Scampi” you can find here. You’ve got a great blog and lovely dishes featured here. I look forward to reading up on many of your recipes. I love shrimp and pasta–a wonderful pair. Great looking site… shout out to a fellow ginger! I am so jealous you get paid to cook for someone in Greece! It looks absolutely delicious ! Log in | 73 queries. 0.459 seconds.